Sometimes I find my entire fridge is full of random bowls of leftover egg whites. I'm still not entirely sure where these come from, but I guess I'm either making a lot of ice cream or they are naturally multiplying in there. Eventually I need a purge, and this recipe is ideal. 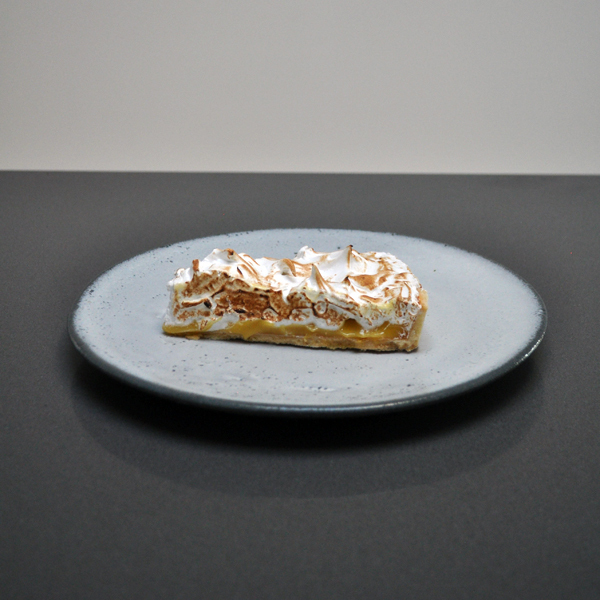 The combination of passion fruit and jasmine tea is really delicious, but that toasted Italian meringue topping provides the killer blow. I say "serves 8" below, but it depends on how many of your guests are in pig mode (read: I ate most of the one pictured). To begin, juice your passion fruit. This is sometimes an arduous process, even if you have a decent orange juicer. I find the quickest thing to do is use the juicer to extract the main juice, then tip the seeds into a sieve and push down with a spoon or crush them against the side with your hand. This will help you get to the 150g required. Next, measure your tea out, and get an empty bowl ready with another sieve over the top. 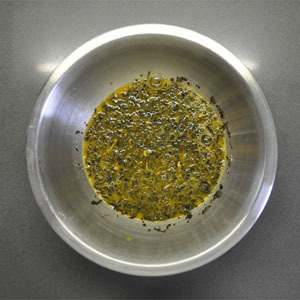 Pour the juice into a small heavy bottomed pot over a low heat, and use a thermometer to get the temperature up to 85C. As soon as it hits, take it off the heat and stir in the jasmine pearls. Set a timer for 3 minutes. When the time's up, pour the juice into the sieve to collect the tea, and give it a push with a spoon to release any retained liquid. At this point you should re-measure the juice, as you'll have definitely lost some during the process. If it's less than 150g, just make up to the weight with water. Now prepare a double boiler - bring water to a simmer in a pot, and place a clean bowl over the top. Pour in the brewed juice, sugar, butter and let them melt together, stirring occasionally. 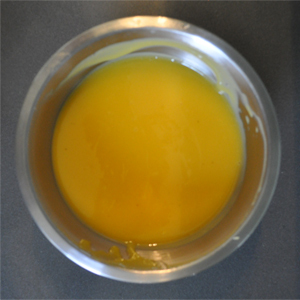 Beat the three eggs until they are homogeneous, then pour that into the juice. Make sure the water stays at a simmer or you'll get scrambled eggs. Stir slowly until combined, then keep it on the low heat and stir every few minutes. Eventually - and that might be 10 or more minutes - the eggs will start to thicken up as they cook. When you reach a nice, thick texture, take it off the heat and strain it again into a clean bowl. Note that as it's hot, it will look more "liquid" than curd normally does. If you want to test the thickness, take a teaspoon out and leave it on the side for a few minutes; if it's thick enough you're done. Leave to cool, then cover with cling film and place in the fridge for a few hours to firm up. This is pâte sucrée, so be prepared for some falling-apart-madness. Attach a whisk to your stand mixer, and add the butter. Whip until the butter has been creamed, then add the vanilla extract, icing sugar, ground almond and eggs. When combined, tip about 1/3 of the flour in. It should be combined in a few seconds, so repeat with the next 1/3 and then the final amount of flour. Stop the mixer when the mixture looks combined and a bit like wet sand. Turn this out onto your work surface and press it all into a smooth ball. Place the ball on some cling film, then flatten slightly with the palm of your hand. Wrap it in the cling and place in the fridge for at least 2 hours. When the pastry has rested, take your baking mat and place it on a tray, then the flan ring on top of this. Remove the pastry from the fridge and, working really quickly, flour it and use a floured rolling pin, roll to a thickness of about 3mm. Dust it with flour again, then roll the pastry back over the rolling pin, lift, and unroll over the flan ring. This is the part where disaster can strike, so try and start the unrolling with enough "edge" to cover the closest part to where you're standing. If it has worked, start pushing the dough into the edges of the ring, leaving any excess folded over the top. Don't trim it yet. If you find any cracks, just patch them with spare pieces of pastry or some of the edge overhang. Turn your oven on to 170C. To help stop shrinkage, freeze the tart case instead of just putting it in the fridge. Leave it in there for about 30 minutes until nice and cold. When you're ready to blind bake, quickly remove the case from the freezer and place some silver foil (matte side down) into it. You will probably need two pieces going in alternate directions to cover the whole ring. Scrunch it down over the top edges of the case so it's completely covered in foil, then gently pour in your baking beans. You need to add a bit of extra cooking time due to the frozen case, so bake for about 20 minutes. After this time it should look anaemic but be solid - so remove the foil and beans, then brush with a beaten egg and return to the oven for a further 5 minutes. Now it should be golden. Remove and leave to cool for about 10 minutes, then use a sharp paring knife to trim the outer edge. Carefully remove the ring, then brush out any pastry crumbs. After it has completely cooled, take your curd and spoon it into the case. Use a spoon or palette knife to even the filling out. Cover with cling film, then place in the fridge to firm up again. This is the fun part. Place your 200g of egg whites into your stand mixer with the whisk attachment. Pour 325g of water into a heavy bottomed pot, add the 85g of sugar, and place over a high heat. While the syrup is boiling, whisk the whites until they are stiff. Reduce the speed, then shower in the sugar until combined. 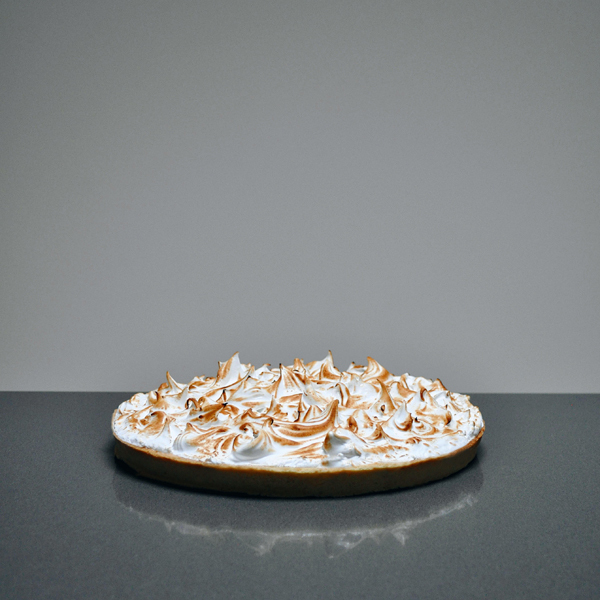 Use a thermometer to measure the temperature of the sugar - when it hits 118C, remove from the heat, whack the stand mixer up to full power and slowly trickle the syrup over the beaten egg whites. Leave this to whisk until completely cool, then place into a piping bag without a nozzle (you just want to get it onto the tart without disturbing the curd). Remove the tart from the fridge. Gently pipe the meringue over the curd, making sure the centre has a bit more than the outside. When it's all in, use a wet palette knife to even out the mass into a small hill. Use a fork to gently "knick" the surface and create small curls - the more of these you have, the more surface area you're going to get toasted and the better it will taste. When you're happy, grab the blow torch and toast the top. The smell is unbelievable. Either serve straight away if you want the curd to be nice and runny, or place in the fridge for an hour or so to firm up. When I take a slice, I like to torch the sides again to make even more of that toasted flavour.